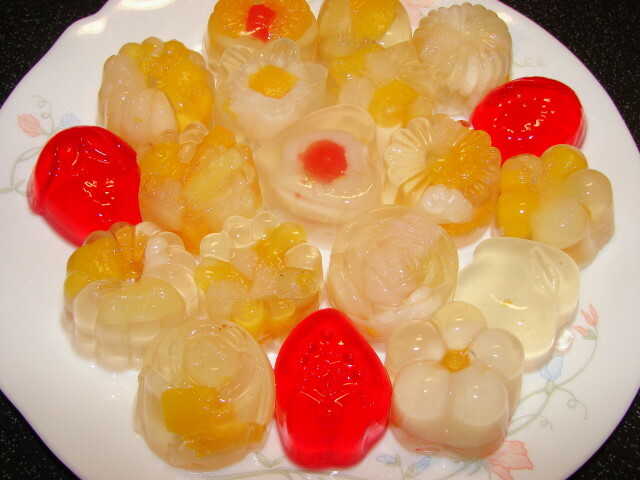 Have you ever eaten S E Asian style Konjac candy, rubbery jelly/jello cups that look like these? I like them but in recent years this candy had very bad press and banned in some countries due to some children choked to death eating them. 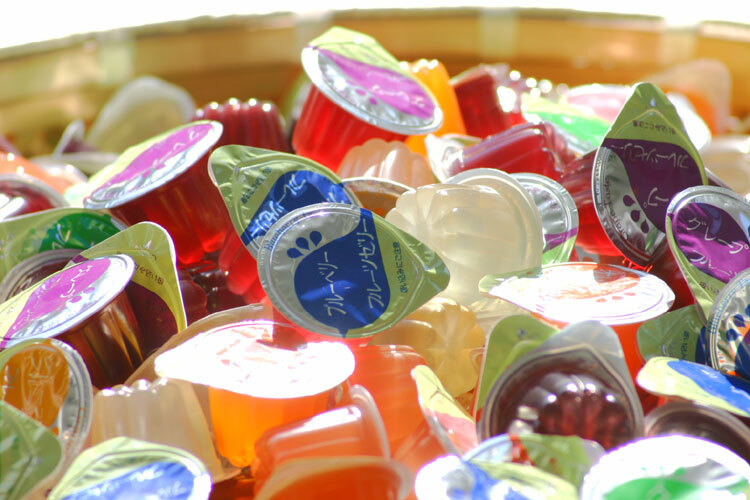 I reckon children could eat these jelly cups without chewing and also sucking the jelly out of the plastic cup can be dangerous because the lump of jelly can slip down into the throat before one has the chance to chew, leading to choking or worse fatality. Konjac is also called konnyaku or 蒟蒻 in Chinese, a gum (gelling agent) extracted from konjac plant or elephant foot yam or devil's tongue. Konjac is widely used in Japan, China and other S E Asian countries for various products. Japanese used konjac to make black or white yam cake for soup or stew. 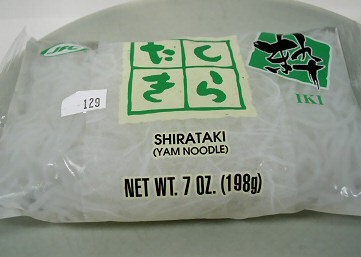 Another common use of konjac for translucent noodles (yam noodles or shirataki noodles). Konjac is not deadly if consumed with care and there are other benefits. It is zero fat, zero calorie (if no sugar is added) and very high in fibre. A very good slimming product because it fills you up without the calories. If you like noodles with carbs free, konjac noodles are great. These noodles are similar to mung bean or glass noodles, texture a bit more chewy or rubbery. In S E Asia you can buy pure konnyaku powder or one already mixed with sugar. I have never seen this product anywhere in England. Most people use this pure powder or ready mixed powder to make jelly/jello dessert, adding flavourings and fruits. Here is a picture of the packet I normally buy. I stock pile every time going back to the far east. This powder will keep for years (beyond its used by date) without deterioration. Pure konnyaku powder is very concentrated. One sachet can make about 1 litre of jelly/jello. By adding fruits you can double the volume. The other advantage of adding fruits is likely safer for children because it is less likely a solid piece of rubbery plug (causing choking) and needs to chew to eat it. Also homemade konnyaku jelly/jello I think is softer than commercial jelly candy because more water is added. Konnyaku jelly/jello is easier to mould into any shape, less fragile than gelatin or agar and it is crystal clear if dissolve in sugar and water without fruit juice. The only negative IMO is it is tricky to dissolve, cook and it sets very quickly on contact with cool surface. Pure Konnyaku powder will congeal forming lumps in contact with water, cold or hot. Best way to handle it is mixing the powder with sugar first. That is why they also sell konnyaku readily mixed with sugar. Once mixed with sugar the starch is diluted and less like to form lumps when wet. Always add cold water to mix. And during boiling needs constant stirring or the mixture can be lumpy or stick to the pan. Here is how I make yummy konnyaku jelly/jello. If you can find this powder give it a try. And if you like the texture it's very addictive. ** if using the powder already mixed with sugar, follow the packet instructions and omit extra sugar. about 1/4 - 1/3 cup sugar if use canned fruits with syrup or fruit juice. If using fresh fruits without fruit juice or syrup, use about 2/3 cups sugar. This is just a guide you can add as much sugar to your taste. You can also use artificial sugar, adjust to your taste. about 1 litre of canned fruits with juice or syrup incl. (I like lychee and/or mixed cocktail fruits). You can also use fresh fruits like strawberry, raspberry, kiwi, fresh pineapple, melons etc... Kiwi and fresh pineapple do not react with konnyaku like gelatin. You can also add nata de coco, like the candy cups. ** Some people like to add a little citric acid powder to the jelly mix. I was told this will make the jelly more rubbery (more Q, Chinese expression for bounciness or rubbery texture). I don't find citric acid is necessary when using canned fruits, fresh fruits or juice there is plenty of fruit acid. If you do use citric acid add 1/2 tsp. If using canned fruits, drain. Keep the juice or syrup. Put juice/syrup into measuring cup and top up with water to 900 - 950ml. If using fresh fruits. Measure 900 - 950ml water. If you like to add fruit juice or fruit squash or grenadine/rose syrup, replace water. If you want to make the jelly/jello without adding fruits, use 1 - 1.1 litre of water or water mixed with fruit juice or fruit squash or grenadine/rose syrup. Grenadine syrup is a good one to use if you like a red colour jelly. *If you only use water and sugar without any fruit juice the jelly will be crystal clear. Put fruits into moulds or small cups, or you can add fruits to the jelly mixture at the last minute when it is ready to pour into moulds. Add water or other liquid slowly while stirring into konnyaku mix. When no longer lumpy add remaining water/liquid at once. Boil at medium to medium low heat, stirring more when liquid starting to get hot and mixture is getting thick. Try not to splash the liquid too much onto the side of the pan above the liquid level, the liquid will set hard if dried by heat or set into jelly rapidly if on cooler surface. This mixture will boil and become very frothy if unattended. When the liquid is hot and konnyaku has dissolved completely (liquid looks clearer and no lumps). It is ready. You can add fruits at this point to the mixture if you preferred. Ladle or pour the liquid into the moulds or cups. Try not to spill this will set very quickly on contact with cooler surface. If you are not working quick enough and liquid is congealing, reheat the liquid, scrape down any congealed bits heat till dissolve. The jelly/jello will set once cooled to room temperature. 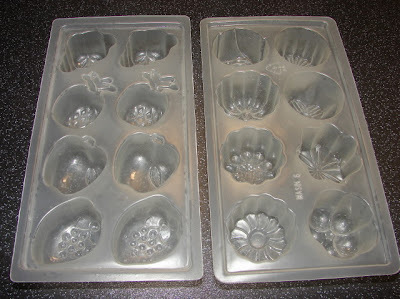 To remove from moulds, use a cocktail stick, tilt the mould downwards, lightly dig the cocktail stick into the jelly/jello from the side of the mould and flip it out. Put into container and chill. Will keep in the fridge for 4 - 5 days if they last that long. I love konnyaku jelly too! I was stock up when I'm back in M'sia or request for my relatives to bring them in for me. I like the chewiness. Very informative post, well done. Wow, they look so beautiful. 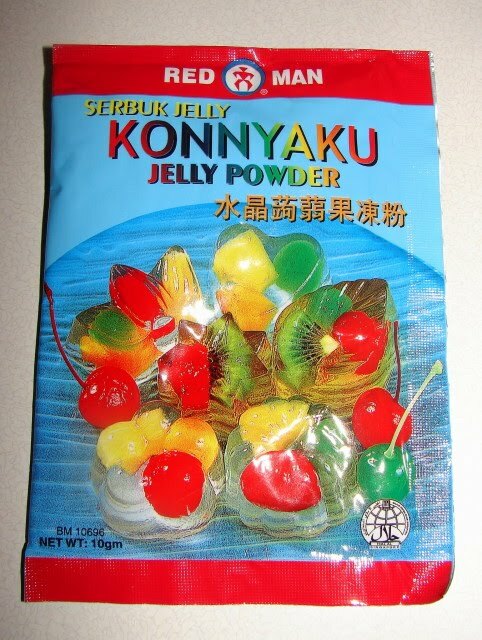 I am living in Houston , Texas and love to buy some konnyaku jelly powder and also the moulds. Would you please help us to buy some by send you a cashier check and mailing address…Please answer…thank you very much for your help. I can't personally help you. You can get the jelly powder and mould from ebay. The second trader is quite helpful. I don't know her but has bought from her. You can ask her for any moulds or the jelly powder too, I am sure she will help you.